The addition of a HTPC (Home Theater Personal Computer) to a home entertainment system is becoming more and more common these days. A consumer can easily build a PC to handle their digital audio and video needs at a reasonable price. From a DIY (Do It Yourself) point of view, there are endless options available. 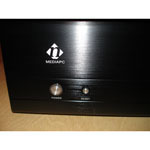 Today, we are going to take a look at one of nMedia PC's newest HTPC cases, the HTPC 500BA.